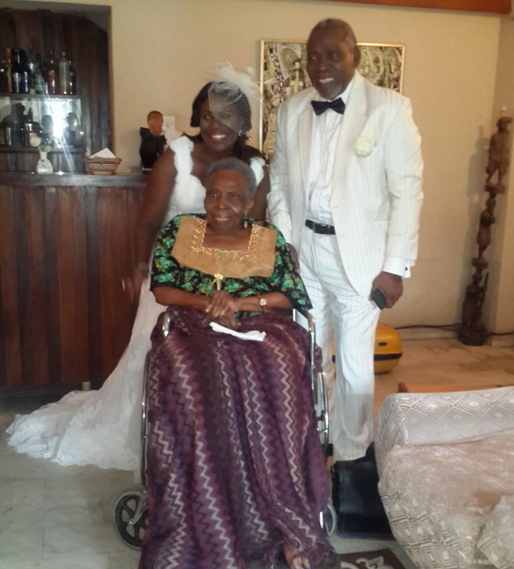 Today is the 30th wedding anniversary of Nollywood actor Olu Jacobs and his beautiful wife, Joke Silva. 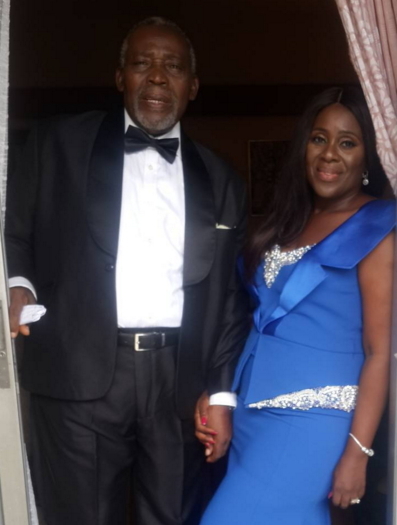 Joke Silva who married the veteran actor on Nov 16th 1985 took to the social media today to shower encomium on those who contributed to the success of their marriage. My late sisters in law mama Shomolu and mummy Ibadan. ..my late brothers in law Papa London and Papa Fermi. ..all of them so protective of me. God in his wisdom has called you home. Your blessing will not decrease. We miss you all. My sisters Bisi Silva and Toyin Olawoye…nudging us to get married those many years ago…Sister Buki& Uncle Laolu Akintobi ..Bunmi Tejumola Faith Eboigbe my warriors…Chisom Ezoke daughter sister friend… Sinmi Adesanya supporters no matter what..Moji Olagbegi pastor in the house. Bunmi and Soji Oyinsan besto of life you never held your punches from either of us and made sure we made it work…Lola Fani-Kayode there from the beginning…taking me by the scruff of the neck and shaking me until I found my way back to my Lord Jesus….Thank you. Our Son’s Olusoji and Olugbenga our Jewels God bless you. May you both find bone of your bones and in the words of my favourite hymn at the moment “Oh God beyond all Praising…”We thank you for these 30 years. May only death do us part and may our love in all its ramifications wax stronger. Thank you all for the good wishes and prayers. God bless you. 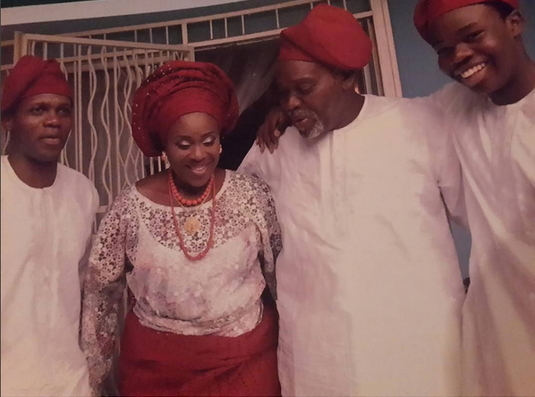 Happy 30th wedding anniversary to the veteran actors. Congratulations to you Mr Olu Jacob and his wife Joke Silver on your 30th wedding anniversary, May God bless u and keep your marriage till your death. You are worthy of emulation in Nollywood..But is a big shame that they only say they look up to you guys, but they don’t emulate your lifestyle. FELICIDADEZ !!! FELIZ ANNIVERSARIO !!!! CONGRATULATIONS !!! HIP HIP HIP !!! HURRAY !. WHAT A GREAT STORY ! MAY OLUWA CONTINUE TO SHOWER YOU WITH DIVINE WISDOM ,SUPERNATURAL SUPPLY OF WEALTH AND INEVITABLE ECTASY OF GOOD-HEALTH .AS YOUR CHILDREN SURROUND YOU, YOU SHALL SEE YOUR CHILDRENS CHILDREN IJN .WHEN A MAN LOVES ,CHERISHES AND PAMPERS HIS WIFE ,D WIFE HAS NO OPTION THAN TO HONOUR AND CALL HIM “my lord ” .UNCLE JACOBS , THANX 4 UR UNDERSTANDING AND PATIENCE , YOU ARE A MEGA-HUBBY .AUNTY JOKE , THX 4 MAKING UNCLE JAC,S LOOK 35YRS OLD !I ADMIRE BOTH ALOT . Happy wedding anniversaries, may the Lord be with your family in Jesus name(AMEN). I pray for that marriage that is about to brake up, receive peace and love in Jesus name, every spirit of Miss understanding,fighting,unhappiness lose your powers over that marriage in Jesus name. hmmm, this is truly beautiful! i pray God almighty to give me and my spouse a joyful union and a continues togetherness in marriage. i adore this family, may God continue to bless ur union. I tapped into your anointing and I received the grace to enjoy a joyful union and continued togetherness in my marriage amen. Congratulation to you, may God keep you till the end of time. you have standout in an industry where many homes/marriage are broken,you have made it thus far through christ.i salute you.congratulation.